If you need to cook for a hungry crowd often, getting a smoker that can fit enough food can be costly. Some of the larger pellet and charcoal options can easily end up costing you over $1000. That’s where gas smokers come in. 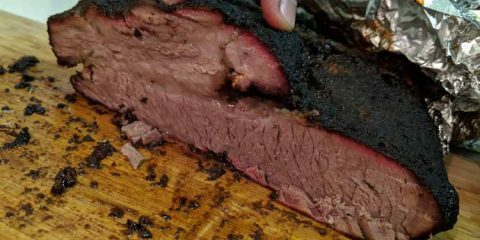 This relatively affordable style of smoker gives you a really simple ‘set it and forget it’ approach to smoking that works well when cooking for a lot of people. And no smoker exemplifies this more than the dual burning 44 inch vertical Smoke Hollow gas smoker. Packing 5 racks and up to 6.5 cubic feet of cooking area for well under $400, we recently named the Smoke Hollow our pick for best large smoker in our guide to gas smokers. Should you buy the Smoke Hollow Gas Smoker? The Smoke Hollow brand has been around since 2005, when Outdoor Leisure Products started producing entry level gas and electric style smokers. Since then they’ve also started producing a range of offset and charcoal smokers, with mixed success. For this review we are focusing on the 44″ Smoke Hollow model. You can also pick up the Smoke Hollow in sizes of 26, 30 and 36 inches. While every model shares the same basic design, there are a few differences which we will discuss at the end of this review. Made out of solid and durable steel, it’s designed to last for years and years of heavy use. Sporting a built-in temperature gauge, it allows you to set its heat at the exact temperature you need. Its temperature capabilities range from around 150 °F to around 300 °F, though you’ll only need to use it around 200 °F to 250 °F for smoking purposes. 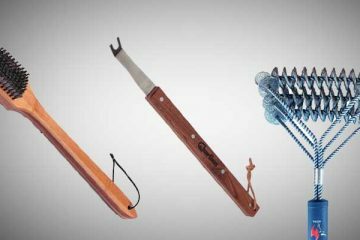 With 5 cooking grids including standard cooking grids, jerky grids, rib rack and a sausage hanger, you get a lot of versatility. Excellent temperature control – This unit can easily maintain very stable temperatures so long as you’re not cooking in a blizzard. Large size with versatile accessories – With a total 6.5 cubic feet of cooking area you should be able to handle even the largest gatherings. It’s also nice that the manufacturers included a rib rack and sausage hanger, as you would normally have to pay extra for these accessories. The rib rack along can hold around 6 racks of ribs. Very Efficient Operation – For the size of this smoker it’s surprisingly efficient. The dual burners do drink up a bit more propane than it’s smaller sized cousins,. Doors Let Out Some Smoke – Unfortunately, the doors on this smoker don’t seem to seal up entirely. This allows some smoke to escape between them. However, this does little to affect the smoker’s overall effectiveness. It still does its job very well. 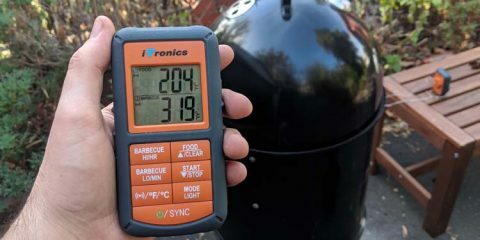 Temperature Gauge has an Itchy Trigger – When setting temperature on this smoker, you have to be careful. Turning the gauge just a tiny bit can up the temperature by as much as 50 °F. 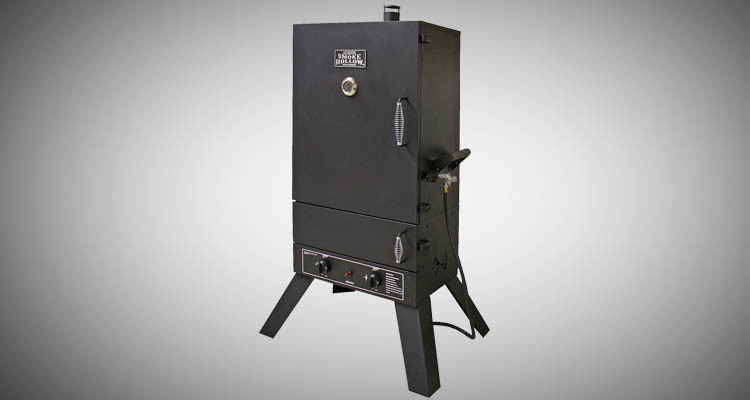 Has Some Durability Concerns – While it’s pretty tough structurally, this smoker is prone to small parts falling off and breaking. This is a blight on an otherwise great smoker. While there are other great propane smokers at its price level, the Smoke Hollow ranks toward the top. Efficient, well-constructed, and thorough, it will damn near guarantee meat with a delicious, smoky flavor. For a smoker of this size at this price point, the Smoke Hollow is a very solid product. Made out of heavy-duty metal, it’s designed not only to withstand wear and tear, but to hold up through inclement weather as well. Its door is equipped with an ergonomic handle, allowing you to open it at your leisure. Sporting a built-in thermostat and thermometer, it gauges the temperature at which it’s set in real-time. Compared to most smokers available at its price level, it is exceedingly accurate. While its thermostat dial can be a little delicate, it sets consistent temperatures that thrive whether it’s hot or cold outside. It possesses two different vents: one on top and one at the bottom. These vents can be easily adjusted to allow for slight and nuanced temperature changes. This smoker is turned on with a push-button ignition system. This allows for it to operate on command. You don’t have to rev it up or waste any time trying to get it to start. As long as you’ve got propane available, you can get it to operate. The vertical smoker design gives you great access to all your food compared to some other smokers. You then access the burners via the bottom door. The propane tank hooks up easily to the smoker. All you have to do is put it in place and twist the gas receiver until it’s nice and snug. The one real issue with the construction of this smoker is that it’s door can have issues sealing entirely. This can lead to some smoke leakage out. This isn’t unusual for a smoker of at this price point though, even the Weber Smokey Mountain leaks out of the door without any mods done to it. It does not have a huge effect on the quality of food overall. Overall, for its price, this is a very well-constructed smoker. 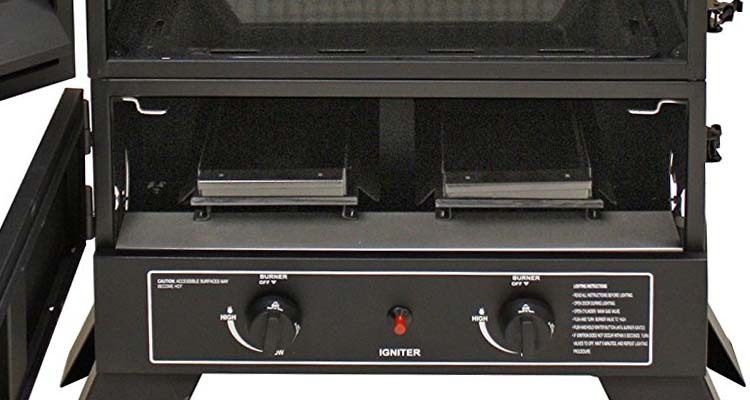 Gas smokers are among the easiest type of smoker to use already. And for the most part, the Smoke Vault is continues this trend. The way in which it’s designed and set up allows for it to do the majority of the work for you. For a smoker at its price level, you can’t ask for much more. Its built-in thermometer and thermostat allow you to adjust temperatures whenever you like. For the most, they are extremely accurate, falling within a few degrees of the temperature at which you set them. 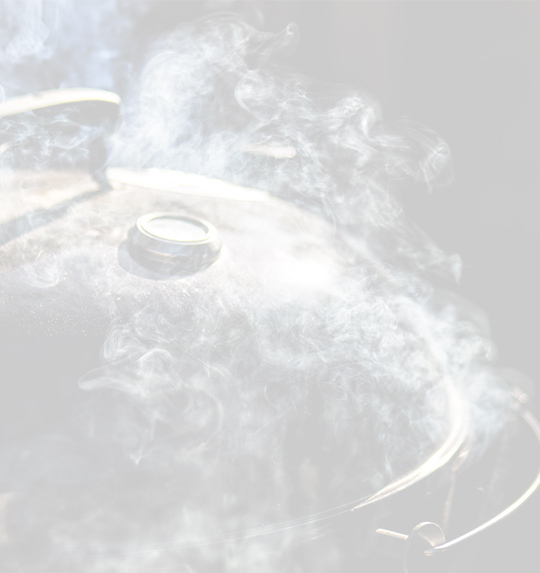 Even cold temperatures do little to affect this smoker’s temperature consistency. This allows you to walk away from it and take part in other activities. You don’t have to constantly hang around and nurse it. 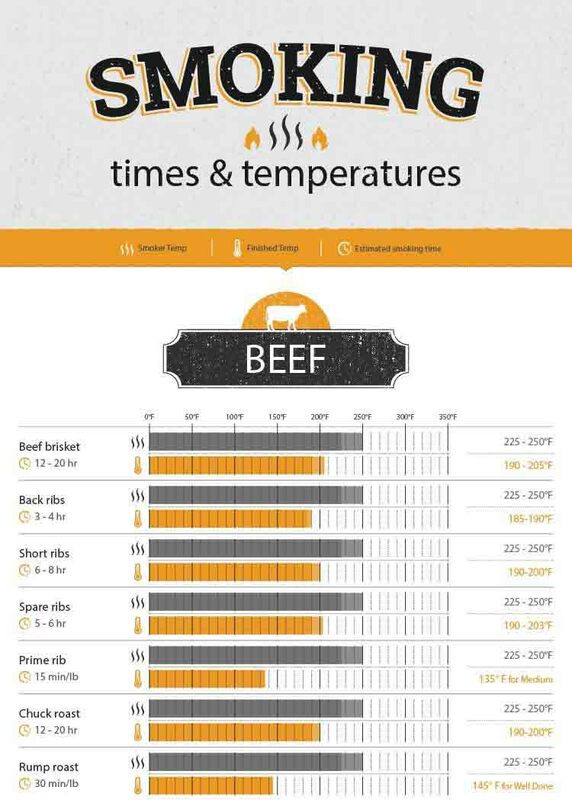 Of course you should still invest in a good wireless thermometer to monitor the temperature of your meat. Watch this whole video to see how to smoke a pork shoulder or skip straight to 5:22 in and you can get a feel for how easy it is to operate the Smoke Hollow. As you can see, it’s capable of smoking quite a bit of meat at once. Now that we’ve reviewed the general aspects of the Smoke Hollow, let’s compare its different sized models. 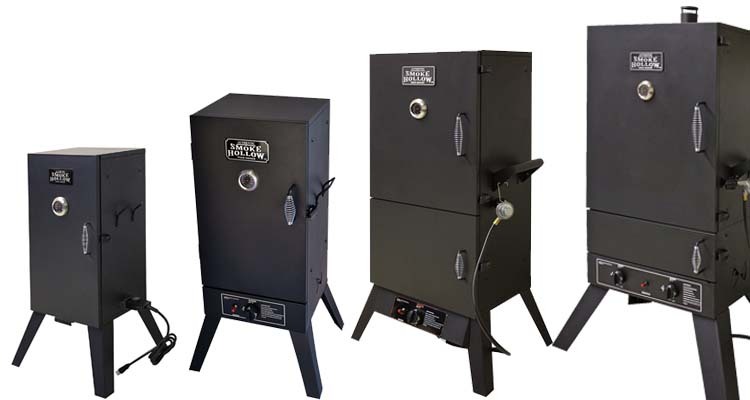 In all, this smoker comes in 4 sizes: 26 inches, 30 inches, 38 inches, and 44 inches. While they all possess relatively similar smoking quality, they all offer something different in terms of features. The 26-inch Smoke Vault possesses two smoking racks. It makes use of an 8,000 BTU propane tank which can easily inserted into its bottom section. 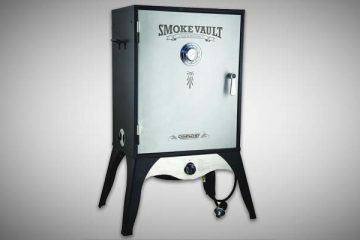 The 30-inch Smoke Vault is equipped with 3 smoking racks which can be removed at your leisure. It uses a propane tank which provides 10,000 BTUs. Like with the 26-inch version, the propane tank can be easily inserted into its bottom portion. The 38-inch Smoke Vault sports a total of 4 smoking racks, all of which can be adjusted to different height levels. It makes use of a propane tank that can distribute 20,000 BTUs. The 44-inch Smoke Vault that we are focusing on in this review is the largest model. It possesses a total of 5 smoking racks. Two of these racks are designed for jerky, two are designed as standard smoking racks, and one is designed to accommodate ribs. It’s also equipped with a sausage hanger. It makes use of a 20,000-BTU propane tank. You can also opt to pay a bit extra for a model that comes with a window. While you might think this is a good feature, watching meat smoke is almost as bad as watching paint dry. There’s not a whole lot going on in there, and after a few smokes it’s just another part you need to clean. Other than that the main noticeable difference between the smokers is in their size. They all possess very similar smoking quality and are equipped with nearly identical features. They are, of course, available at different prices, but none of them are priced so high that they’ll break the bank. Overall, the Smoke Hollow Propane Gas Smoker is a terrific smoker for those who are looking to smoke a lot of meat on a budget. It’s not a high-end smoker by any means, but performs terrifically well for a smoker at its modest price point. While we’ve focused on the larger model, everything we’ve mentioned about this smoker applies to the smaller models. So if you’re not going to be cooking for as many people feel free to save some gas and buy a smaller model. Providing plenty of space for meat, the Smoke Vault is efficient and easy to use. 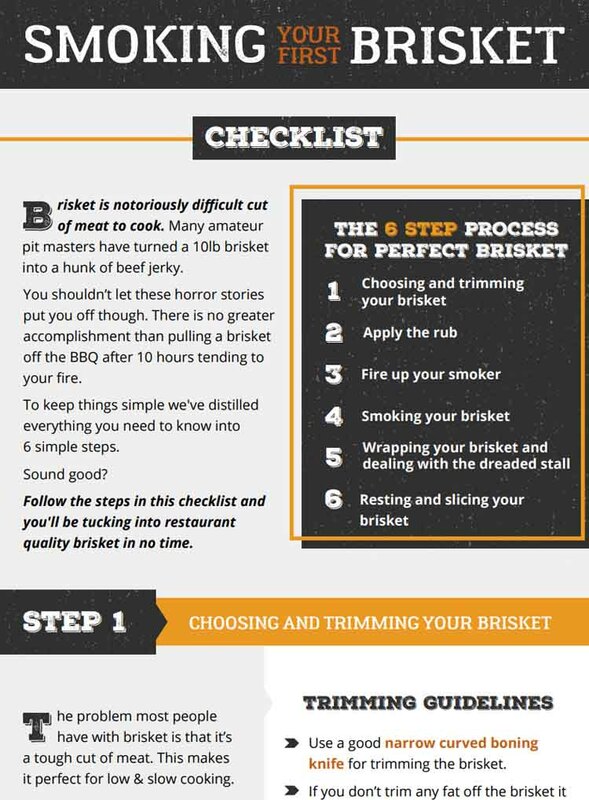 If you’re looking to get into the practice of meat smoking, this is a great smoker to get started with. It will allow you to learn the intricacies of smoking, and will produce some pretty taste food along the way as well. 30” sportsman elite model a piece of crap. Purchased assembled attempted to season per instructions. Would not heat kept defaulting temp to 42 deg. Returned to Cabela’s great people. Got refund no hassle. Suggested they drop the brand. Hey Charles thanks for your comment. Are you referring to the Masterbuilt 30″ Sportsman Elite? IF So we agree that there are better smokers out there for your money, but it may just be that you got a defective unit. It does happen from time to time. Glad to hear you got it sorted though! I purchased the Smoke Hollow 38 inch propane smoker with window and can say I’m pretty satisfied with this unit. Purchased on Amazon for $211+change and it rocks. Of course like most smokers you need to add gasket media, I added lava lock self adhesive tape. Think about it, metal on metal will not seal, lock it down! I also purchased a Tel-tru thermostat on the side of the smoke to double check accuracy of the gauge on the door. 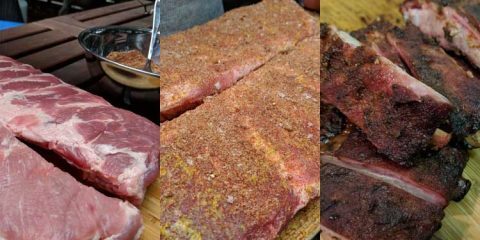 I am recreational smoker,… at best, but I smoke every weekend, and the first rack of ribs I made we awesome. Oh yeah, I also have a smoking tube that burns pellets to supplement the smoke. The good thing about the tube is that I can cold smoke cheese. Keep in mind, the window will need to be cleaned every use with vinegar, due to build up of creosote on the window. 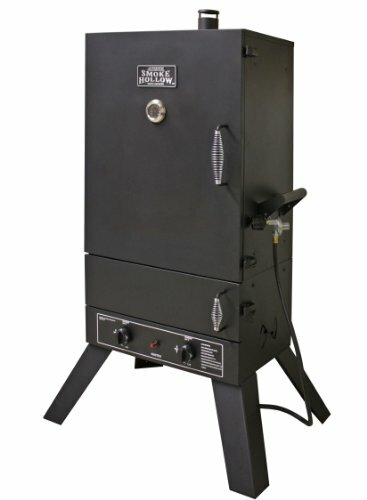 In summary, for the price and a couple simple after market additions, any beginner to intermediate smoker would like this unit. Great to hear how the Smoke Hollow has been treating you Jeff. All of those mods you made sound excellent. With a little bit of work you can make a “budget” smoker perform just as good as some more expensive models. Keep up the good work!